For pretty much all of history all the way up to modern times, in most parts of the world the choices in siding on homes and commercial buildings has been dictated by what’s produced locally. So in forested areas people then and still do use locally milled wood products to cover their homes. Then in other areas of the planet where rocks and clay are abundant stone and brick covered buildings are all the rage. Here in Tampa Florida though, it’s a completely different story, because now the world is your oyster when it comes time to decide what you are going to use for siding. Products from all four corners of the globe are available right along with a host of newer man-made siding products, and that of course includes all of the newer high-tech composite materials. So the following is a list to help you become more familiar with your options before you make any final decisions on your remodel or new construction project. Wood Siding is versatile and attractive, so it’s always has been a popular choice when it comes time to cover a building. It’s easy to obtain locally in a wide variety of styles, easy to shape and cut to fit, easy to paint or stain to a variety of colors, and as an added bonus wood is 100% biodegradable. Two things in particular though, have factored together in recent years to detract from the popularity of wood siding, and the first one is the Formosan Termite, a ferocious eater that can do serious damage to wood siding in a relatively short period of time if a building isn’t treated. Then the second strike against wood in recent decades comes in the form of logging restrictions in Canada and the US that have worked together to drive up the cost of wood siding considerably. In the balance though, wood siding does hold the lead against all others in the area of choices and options in types and styles. Vinyl Siding is a popular choice for home and business owners for several reasons. First of all vinyl siding is attractive, and now comes in a wide range of styles and colors. Then secondly it will always be an affordable choice because the siding itself is relatively inexpensive when compared to other types of siding, and it’s less labor-intensive because it goes on rather quickly. 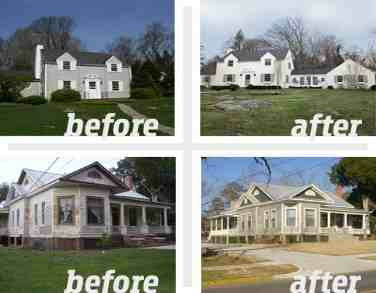 Vinyl siding is also impervious to dry rot and insect infestations. And finally, vinyl siding never needs to be painted, is available with or without insulation backing, and now thanks to better formulated vinyl has a longer service life that stands up better and resists cracking. Brick or stone siding works well to give the visual impression of permanence to a home, or commercial building because it can in fact last for centuries. Brick and stone siding is among the most costly though, because the materials are not only expensive to buy, but then they require specialized skills to do the job that is always labor-intensive. Brick and stone siding age well though, so it’s always been a popular choice in areas of the country that are subject to extreme weather conditions. Brick in particular ages so well that most people are surprised to learn that salvaged used red clay bricks cost more than new ones. Composite siding is one of the more recent developments in the building industry. The word composite, by definition, means a blending of more than one substance, so all types of composite siding are just that; materials that are blended together and then formed. Composite siding types that are made from wood fiber and a binding resin are a popular and affordable choice, and the composite siding products that are made from recycled wood or cellulose are a great way to lower the carbon footprint of a building. Cement composite siding though, continues to gain in popularity because it looks just like wood lap siding, yet is completely impervious to termites and dry rot. Metal siding comes in an incredible number of types and variations, and that also includes the types of metal that it’s made from. Copper metal siding, for instance, is among the most durable and attractive. It is very expensive though due to the high cost of the copper it’s made from, but there are buildings in Europe that have copper roofs on them that are centuries old. Aluminum metal siding is corrosion resistant and is now available with high-tech coatings that her warranty for up to 50 years, and it’s available with solid foam insulation backing. Steel metal siding the most affordable and overcomes the corrosion issues with new high-tech coatings that are also warranty for up to 50 years. Then finally one benefit that all metal siding products share is that they’re easily recyclable. Stucco siding continues to grow in popularity because it’s durable, and termite and dry rot proof, and it looks great. Stucco siding is also low maintenance, and once it’s on works well to seal a home up because there’s no seems in it. Stucco siding used to be viewed as being costly when compared to other siding systems like wood and metal siding, but rising prices in both those products has worked to turn the table and make stucco siding now the more affordable choice in many instances. It’s also readily obtainable because it’s made out of chicken wire and cement, but this system does require specialized skills to go on and a crew of some three workers to do the job. Sheer-panel siding is an important secondary component of most siding products that go on homes and commercial buildings today. Sheer panel siding is essentially quarter-inch plywood that’s installed on a wall to provide necessary structural support. It will always call for an engineering nailing schedule that dictates how many eight penny nails are to be driven in per sheet, with the common standard being 8 inches apart on the edges and 1 foot apart on the interior area on each stud. Sheer panel provides a building’s strength on it’s outer and interior load bearing walls that most siding products can’t provide. Tyvek siding underlayment goes on after the sheer panel is nailed off and before the siding goes on. That is unless the siding that’s being installed is a type that provides sheer panel, such as 4×8 sheets of T-111 plywood siding. In that case the Tyvek goes on directly over the studs with no sheer panel being installed. Tyvek is the trade name of a durable plastic sheeting that is sometimes referred to as ‘house wrap’ because of the way that it completely seals a home in to block out moisture once it’s installed.